Polished wood, burnished brass, a giant globe of the world and a gentleman Sea Captain in a navy blue blazer greet you as you enter the foyer of Disney Resort’s Yacht Club at Walt Disney World. You’ve now entered Disney’s version of turn-of-the-century Nantucket complete with a lighthouse and its’ own white-sand beach and marina on Crescent Lake. My family and I had just two days and two nights to explore all the Yacht Club had to offer, and we still didn’t get to everything. If you’re looking to enjoy some time with the family outside the parks, the Yacht Club has something for everyone. The Yacht Club is connected to its sister resort, the Beach Club Resort, and sits on the opposite side of Crescent Lake from the Boardwalk Inn and Villas. All three resorts and Epcot are accessible by a walkway around Crescent Lake or by boat. Disney’s Hollywood Studios is also a short boat ride away. It’s just a 10-minute walk from the Yacht Club to Epcot or the Boardwalk – a replica of an early 20th century Atlantic coast boardwalk. There you’ll find a carnival midway, street performers, restaurants and nightlife – a great way to spend the afternoon or evening. The Yacht Club and Beach Club Resorts are the only resorts at Disney World that have a shared mini-water park. 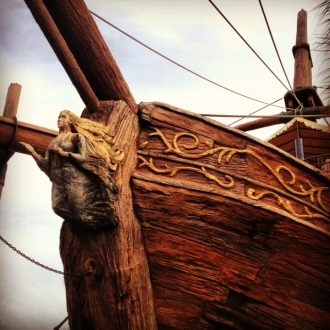 Stormalong Bay is a three-acre water recreation area with a life-size shipwreck where a spiral staircase 150 feet in the air takes you down a water slide that empties into just one of three sand-bottomed lagoons, all connected by a meandering river. Pools in alcoves away from Stormalong Bay allow you to relax away from all the action. On the beach next to Stormalong Bay is a 24-hour children’s playground. A swing set overlooking Crescent Lake kept our six-year-old daughter Reagan happy for hours. When it’s time to take a break from the pool and playground for lunch, the old-fashioned ice cream parlour, Beaches & Cream is a popular spot. Located right next to the Lafferty Place Arcade under the covered walkway of the resort that opens to the beach. Or, enjoy the view of Stormalong Bay on the patio under an umbrella at Hurricane Hanna’s Grill. Expect to pay a premium for your ordinary hot dog, hamburger or sandwich at any of these casual dining spots. However, the French fries served with all meals were a nice surprise: homemade sliced potato chips. 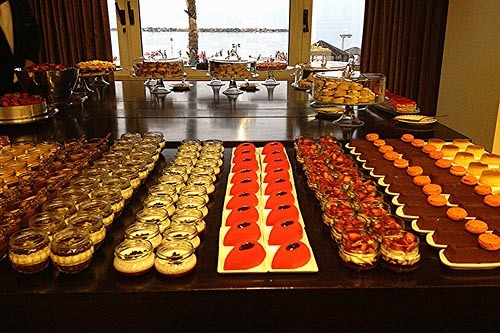 Dining options at the Yacht Club are some of the most varied at any of the Disney Resorts. From fine dining at Yachtsman Steakhouse to casual dining at Cape May Café or the Captain’s Grille. The Beach Club Marketplace is supposed to be a quick dining option, but expect long lines at lunch during high season. We waited in line for 30 minutes to purchase a hot dog, sandwich, muffin and two drinks. TIP: A refillable souvenir 16 oz. insulated mug is available at Beaches & Cream Soda Shop, Hurricane Hanna’s Grill or the Beach Club Marketplace for $15.49 and can be refilled with coffee, iced or hot tea and soda at these locations for FREE. My favorite thing about the Yacht Club, besides the nautical décor, was the amount of entertainment and recreation available without ever leaving the resort. In the evening, after being all tuckered out from a day at Stormalong Bay, we watched a movie under the stars on Crescent Lake Beach. 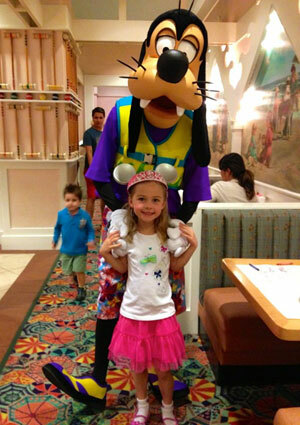 In the morning, while I was at the Traveling Mom Retreat, my husband Danny and daughter Reagan enjoyed a breakfast buffet with Minnie, Donald at Goofy at Cape May Café´. Very few Disney Resorts offer character dining, so this was a major plus for us to keep Reagan entertained during the two days we had before the three of us enjoyed the Parks together. And we found that it was reasonably priced for a character breakfast. 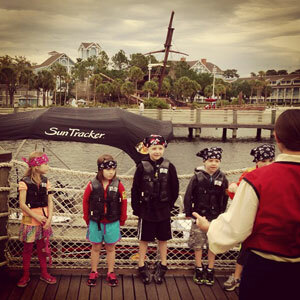 On our last day at the Yacht Club, Reagan got to set sail on a Pirate Adventure Cruise! Scallywags 4 to 12 years old don pirate bandanas and board a seasoned vessel (in this case, a motor boat) in search of clues to discover hidden treasure. At the end of her Albatross Treasure Cruise, Reagan had a bag full of booty and treasured memories to boot. TIP: Make reservations for character dining at Cape May Café and the Albatross Treasure Cruise in advance of your arrival by calling: (407) 939-5277. The Yacht Club is located near one of only five Children’s Activity Center locations at Disney World. The Sandcastle Club is next door at Disney’s Beach Club Resort. We never had a need to utilize the club, as Reagan remained plenty entertained with everything else there was to do. For those who like to stay fit while on vacation, the Ship Shape Massage Salon and Fitness Center has everything you need. Play a game of croquet on the giant green lawn. Play beach volleyball near Tidal Pool or tennis near the Admiral pool. Complimentary equipment is available from Ship Shape Health Club. There are also several jogging paths in the area including a loop around Crescent Lake. Take a guided Bass Fishing catch-and-release excursion leaving from the Yacht Club’s marina. You can also rent a motorboat, canoe, kayak, pedal boat or sailboat from the marina and Captain your own adventure! Photo credit: Exterior shots of the Yacht Club and standard room patio courtesy of Walt Disney World Resorts.